Somewhere in the middle of Pacific City in Huntington Beach (a complex similar to the Grove) sits a very popular restaurant known for their brunch. With breathtaking ocean views, Bluegold is something that is casual with a little bit of finesse. The restaurant serves up popular breakfast items with a twist along with deliciously crafted cocktails. Upon arrival at 12:30pm, we were told they were seating us at the best seat in the house but that it would be a few minutes before we could be seated (we had changed our reservation from 12:30pm to 1:00pm to avoid being late). My friend and I went to grab a drink at the bar and waited to pass the time. We weren't seated til about 1:30pm, a full thirty minutes past our reservation and an hour of waiting. Additionally,it took them another 40 minutes to serve us our food following our order. We had ordered a hot mocha, which ended up being cold. Thankfully, they remedied the situation by making a new one. I mean, I'm cool with waiting, but it was kinda ridiculous how long we waited for the food being served. That being said, a few of the dishes we ordered were delicious and some not so much. MY FAVORITE DISH. MILK ROLLS ($5.00): Hazelnut Honey, Citrus Conserva. This was bomb dot com. It came out piping hot and boy, was I in for a treat. It was an amazingly soft and buttery bread full of delicious goodness. I seriously would just come here and only order this all day, everyday. The honey and the conxerva was good together. The rolls are fantastic on its own as well as with the condiment. 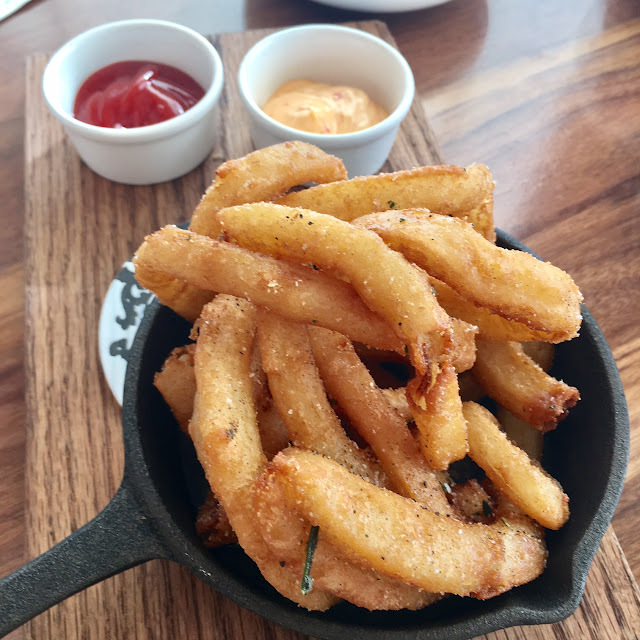 ONION RINGS ($7.00): Curry Ketchup and Goddess Dip. I thought the onion rings were pretty good. It was super crispy and seasoned well with hints of rosemary. It was lighter in texture using a tempura batter. The rings weren't too onion-y if that makes sense. My friend liked it even though she doesn't like onion rings. I liked the goddess dip better than the curry ketchup. 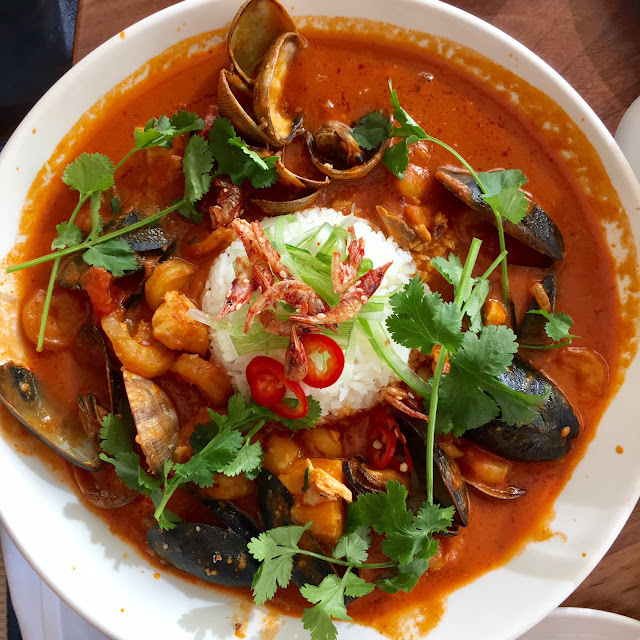 PAN ROAST STEAM KETTLE ($18.00): Cream, Butter, Clam Juice, Chili, Buttered Rice, Oyster, Clams, Shrimp, Scallops, and Daily Market Fish. This pan roast had a nice kick. It had tons of seafood if that is to your liking. My friend thought it was a tad bit too spicy for her. I thought it was pretty good in flavor, but I actually prefer the steam kettle at Kettlebar over this. 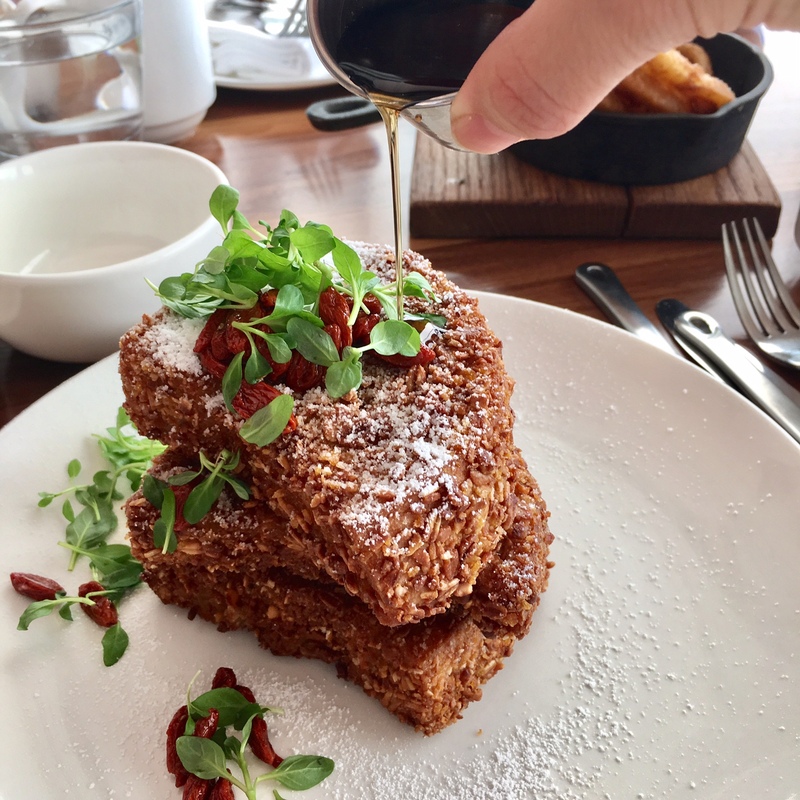 GRANOLA FRENCH TOAST ($13.00): Whipped Ricotta, Goji Berries, Honey and Almonds. So I chose this dish because I wanted to pick a healthy-ish option. I mean, from the sound of it, it sounds pretty healthy. Boy, was I wrong. It was a greasy mess. As good as this looks, it oozed out grease. They deep fry up this bad boy (which I usually don't mind), but unfortunately, this soaked up a lot of the oil and that's all I could taste. I actually only had two bites and I was done. The concept is good but the execution was no bueno.